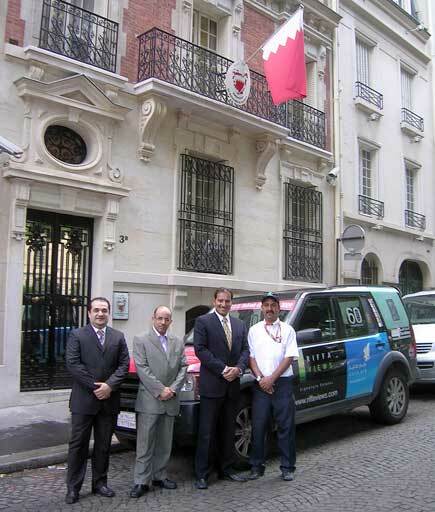 Also present at the meeting was Ebrahim Ali, Third Secretary at the Bahrain Embassy in Paris. I was really pleased to see that both the embassy and Gulf Air were very keen to work with us, or indeed anyone who wants to promote the kingdom. Later, we drove to the Bahrain Embassy and met Charge d'Affaires Shaikh Khalid bin Mohammed, who spoke about how important missions like Friendship Arabia were to promote understanding among all countries and cultures. Following the meeting, I went to see my friend Khadija Al Salami, a filmmaker who had come to Bahrain to screen her multiple award-winning film Amina, a true story about a girl who was sentenced to death in Yemen. We had a good lunch, then Khadija drove me back to my car which was parked outside the embassy. The embassy was still open, and Ebrahim kindly offered use of the Internet to send my report and pictures. From here, I will be driving to London, where I have another embassy appointment to keep.